Seeing as how this is a Community Day that boosts the effectiveness of Incubators, those should be the main item you use throughout. Stardust is the currency in this game, and with the extraordinarily high costs of second move unlocks, it is well worth your time to throw one of these on while catching all those Totodiles. You most likely will be walking a lot, so making sure you’re Incubating and Super Incubating as many eggs as possible, in order to cash in on the stardust from hatching and get after any hatches that may be alluding you. Poké Balls for catching everything, specifically Great and Ultra Balls. Lucky Eggs for when you do raids during the day and to help leveling overall. Lure modules to take advantage of the 3 hour lures. Incense to attract more possible shiny Totodile. This is the absolute best you can find in the wild. Being late is never a good thing, get around your spot early and see what changes into Totodile. Pokémon you have not caught prior to the event start can turn into Totodile, it is best to wait to catch until the event starts. Be patient – there will always be errors and bugs at the start of the event. It is best to restart the app in some, if not most, cases. 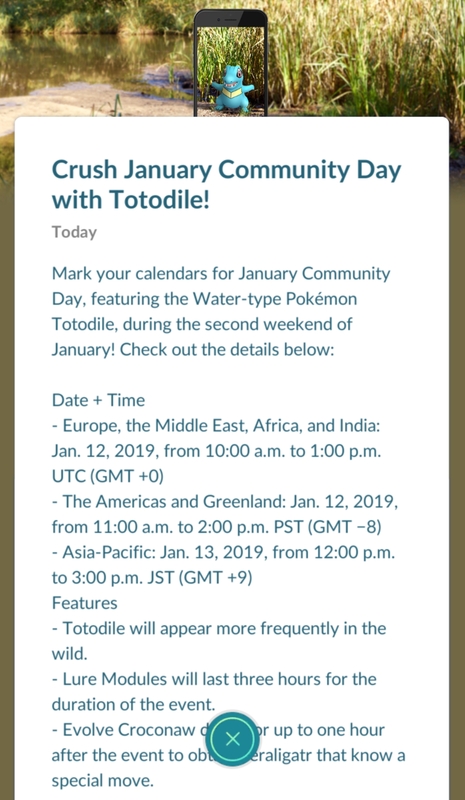 Expect a Community Day box to drop roughly a few hours before the event, it might be the discount you need or were looking for. To ensure that you have Lures up the entire duration, do not lure prior to the event start, as those will only last 30 minutes. You will know when Community Day is on, just watch for Community Day spawns, the lag spike, the spinning Pokéball, and the almost inevitable need to restart. Lures will last for three hours then. Use Incense to attract even more Pokémon to you while you’re out hunting. If you are wondering, yes Incense can spawn Community Day ‘mons, that can be shiny. Incense is worth it. Promote the new Pokémon Go features and events to Trainers who are just starting their adventure or haven’t been playing for a while. People are coming back around due to trading, Generation IV’s slow rollout, PVP, and these community events. 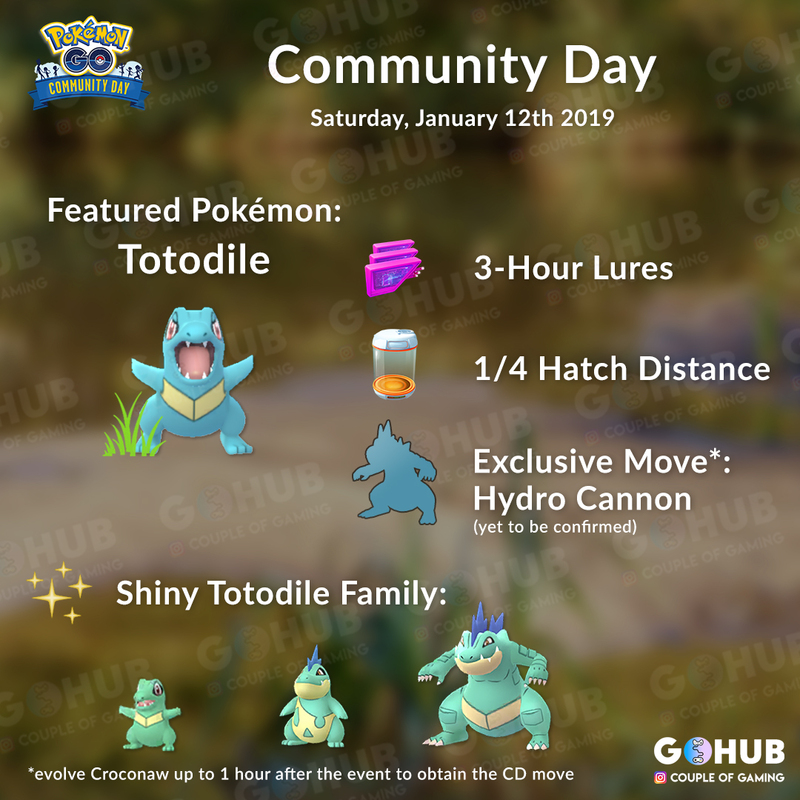 The post Totodile Community Day Guide: January 2019 Community Day appeared first on Pokemon GO Hub. News Roundup January 8th: New Clothing Options and Rare Candy Rewards!